Naukluft Namib is a beautiful area between the main Namib Desert and Swakopmund on the Skeleton Coast. The Naukluft Mountains edge the desert areas making them a perfect backdrop often reflecting the evening light in a gorgeous amber warm glow. Places to stay in Naukluft , include any guestfarms hotels lodges, guest houses, self catering accomodation, bed and breakfast, backpackers and camping. 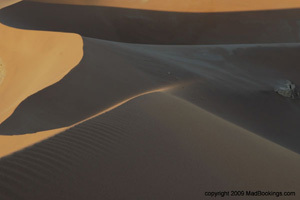 The Namib Naukluft Park is the central part of The Namib Desert. Sossusvlei, Sesreim Canyon and Dune Forty Five being the most well known destinations. Sossusvlei’s uniqueness, make it one of the most popular ‘ must sees’ on any itinerary to Namibia.